We all have people in life that we look up to as a source of inspiration and my step-daughter is that person. Even with all the issues that the disease and life in general brings her, she won’t allow the disease to control her life. At times when I think things are a bit tough I think of how tough things are for her and I get on with it. After three knee operations and some very tentative training I decided that before I got too old I wanted to raise money for the UK Gauchers Association who provide support to patients and their families. For 15 years, my step-daughter has had a great deal from the Association, providing us with friendship and up to date information on research, clinical trials and new treatments and I decided I wanted to give something back. days as no one really knew how the altitude was going to affect them. The guides set a very slow pace as even on day one we were at a height where the air is thinner than we are normally accustomed to. During the next six days we hiked through terrain from pine forest, scrub and heather to marsh and large rocky dusty expanses. With the change in scenery came quite dramatic changes in weather and temperature. On day two we had a 10 hour hike with a height gain of over 1000 metres but during that time we experienced high winds with rain, with snow and with hail. The hail felt like needles and I can honestly say a tent has never looked as good as it did at the end of that day. ascent to Uhuru peak, its highest point. Everyone was feeling the effects of the past few days and the altitude was taking its toll. Team members, who were normally very chatty, fell silent and everyone focussed on getting ready and ensuring they had everything they needed. The departure was in the pitch black with only our head torches for light. There were several teams ahead of us and their head torches looked like moving stars. It was a relentless steep uphill climb on energy sapping shale. I focussed on the person’s feet in front of me and blocked out the voices in my head asking what I was doing and telling me to stop. After what felt like an eternity we reached Gillman’s Point on the rim of the crater and a hot surgery cup of tea greeted us. Unfortunately due to the altitude we had lost one of the team 50 metres below Gilman’s Point. 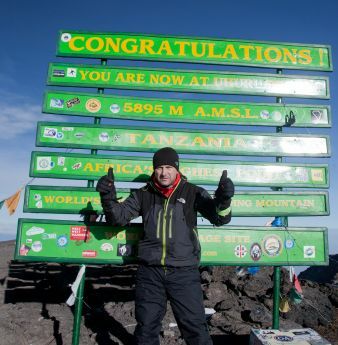 We then walked around the crater rim in snow several inches thick to the higher ground at Uhuru Point (5,896m up) and the big sign highlighting that we’d made it. Our guides had timed our walk to perfection and we all watched the sun rise over Kenya. I can honestly say this trek has been the hardest thing I ever done both physically and mentally, and whilst trekking I’d unknowingly developed pneumonia. The breathing difficulties I had been suffering for the past 5-6 days I thought were the effects of altitude so I continued on. The trek was a once in a lifetime experience that I will never forget and I’d like to thank everyone who supported and sponsored me.